Infielding is a general term that represents the various fundamental plays needed to become a good infielder. 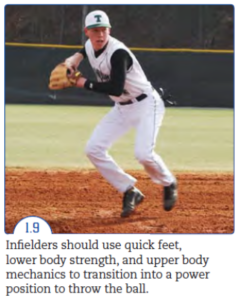 It is helpful if players possess specific physical attributes to increase their odds for success at the higher levels of baseball. 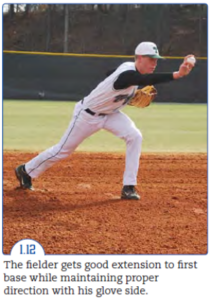 For instance, middle infielders (i.e., shortstop and second baseman) are right-handed throwers who possess soft hands, quick feet, and superior hand-eye coordination. Third basemen are also right-handed throwers who are typically big and strong, and they also have quick reflexes and powerful arms. First basemen, who throw with either their right or left hands, are typically tall to provide a large target for fellow infielders, and they are efficient at picking errant throws out of the dirt. As players progress through the middle school (grade 6 to 8) and high school ranks, their footwork, body control, arm strength, and range should significantly improve. To help players develop they should be continually challenged to execute their fielding mechanics at game speed in order to create good muscle memory and increase consistency. 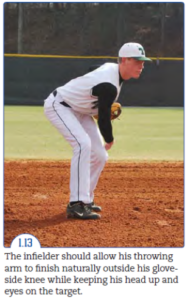 At the high school level and above, hitters generally run to first base in just over four seconds. Therefore, infielders should eventually be able to execute proper fielding fundamentals (from the time the ball is hit until their throw reaches first base) in less than four seconds. Technically there is no such thing as a “routine” ground ball. All plays, whether a four-hopper hit right at the fielder, a ball hit to his backhand side or glove side, a double play feed, or a slow roller are challenging to execute. However, for classification purposes,, “routine” is a word used by many in the game of baseball to represent a play that should be made by the defense. Unsuccessfully executing the play would be classified as an “error” by the official scorer. The most common routine play that must be made in the infield is a ball hit on the ground directly at a player or hit slightly to his glove or throwing side. Middle infielders have the luxury of knowing which pitch is going to be thrown because they can see the catcher’s signs to the pitcher. They should use this valuable information to their advantage by deceptively adjusting their positioning as they “creep” (take small steps forward) into their ready position. They should adjust slightly to their left or to their right based on whether the pitch will be a fastball or an off-speed pitch. For example, if the catcher calls for a curveball to a right-handed batter, the shortstop anticipates the batter will pull this pitch. Therefore, he should attempt to cut down his distance to the third base side by creeping into a ready position in right-left pattern where he takes a step with his right foot laterally instead of straight towards the plate. This will effectively cut down his distance to the third base side and increase his chances of making a play to the side. Note. 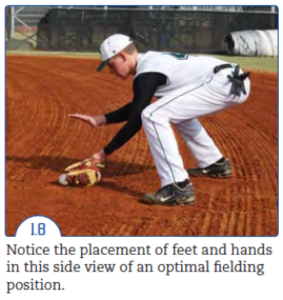 The footwork and glove positioning for a left-handed first baseman is opposite that of a right-handed fielder when executing routine ground ball mechanics. 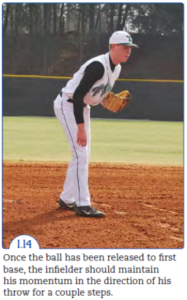 Before each pitch, the infielder should feel relaxed and think about the potential game situation that could arise if the batter hits the ball. This will allow the fielder to make the correct decision about where the ball should be thrown if it is hit to him. 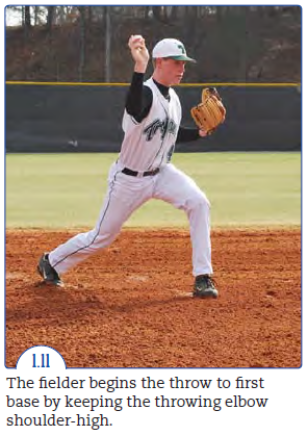 In addition, middle infielders should use the catcher’s signal to the pitcher to anticipate where the batter will likely hit the next pitch (Figure 1.3). When the pitcher is about to release the ball to the hitter, the infielder should begin to creep forward and get his body into a position where he is ready to quickly react to a batted ball. He does this by taking small steps (left then right, or right then left) toward the plate. The infielder’s body should end up in an athletic position—with his feet spread apart slightly wider than his shoulders, knees slightly bent, hips slightly flexed, weight slightly forward, glove out in front of his body with the pocket facing the batter, and eyes on the “strike zone” of the hitter. It is critical that both of the player’s feet are on the ground before the ball is hit in order to maximize his ability to cover the greatest distance in the shortest amount of time. A player does not want to get too much forward momentum because he will have difficulty reacting side to side (Figure 1.4). 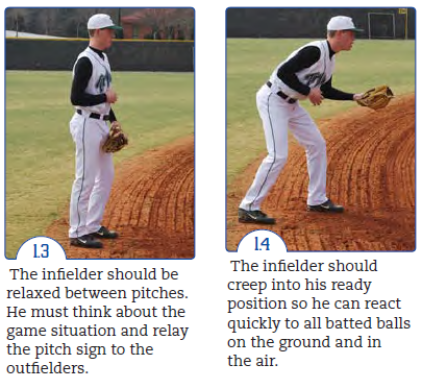 The middle infielders can share their knowledge of the catcher’s signal for the pitch with their outfielders. For example, the shortstop places his throwing hand behind his back and looks in at the catcher’s signal to determine the next pitch. Then the fielder makes a quick fist to indicate a fastball is being thrown, or opens his hand wide to indicate an off-speed pitch is being delivered. 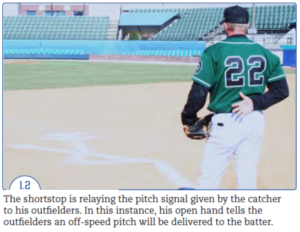 Because the signal is given behind the infielder’s back, only the outfielder can see it (Figure 1.2). As soon as the pitcher is about to release the ball to the plate, all infielder should focus their eyes on the imaginary strike zone of the hitter instead of watching the ball travel to the plate. This gives players an advantage of knowing where the ball will be hit before it makes contact with the bat. For example, when looking at the imaginary strike zone of a right-handed batter, the shortstop notices the hitter’s bat head arrives before the ball (which enters the imaginary strike zone through the fielder’s peripheral vision). This hint lets the shortstop know a fraction of a second before contact is made that the ball is going to be pulled. As a result, the shortstop can start to move in that direction before the ball is hit. Successfully implementing this skill will increase his distance to the left and the right. Once the routine ground ball is hit and is bouncing directly towards the fielder, teach players how to use their feet to quickly “round off” or “V-Cut” as they approach the ball. This is achieved by moving the body slightly to the right of the ground ball as the player prepares to field it. This vantage point makes it easier for him to judge the speed of the ball, pick out the correct hop, and eventually create momentum to first base. The player should them move his body to the left in order to put himself in the correct position to receive the ball (Figure 1.5). 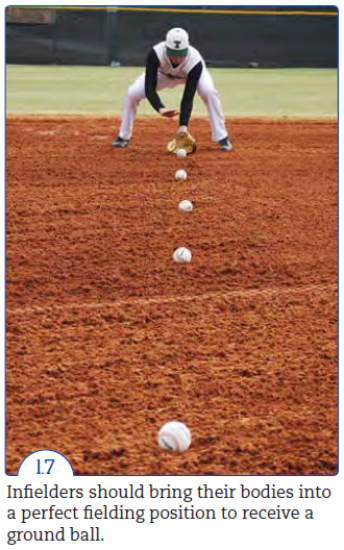 As they round off the ground ball, fielders should speed up or slow down in order to field the hop of their choosing. Ideally, players first look to field a “big-hop” (long hop) when the bounce has passed its peak and the ball is on the way back down. Their second choice is to catch the ball off the “short-hop,” where the ball has just struck the ground and is beginning to move back up towards the peak (Figure 1.6). As a player begins to move back to the centre to put himself in a good position to field the ball, he should stay under control, gradually lowering his body, widening his feet to create a good base (athletic position), and moving his glove forward in front of his body. 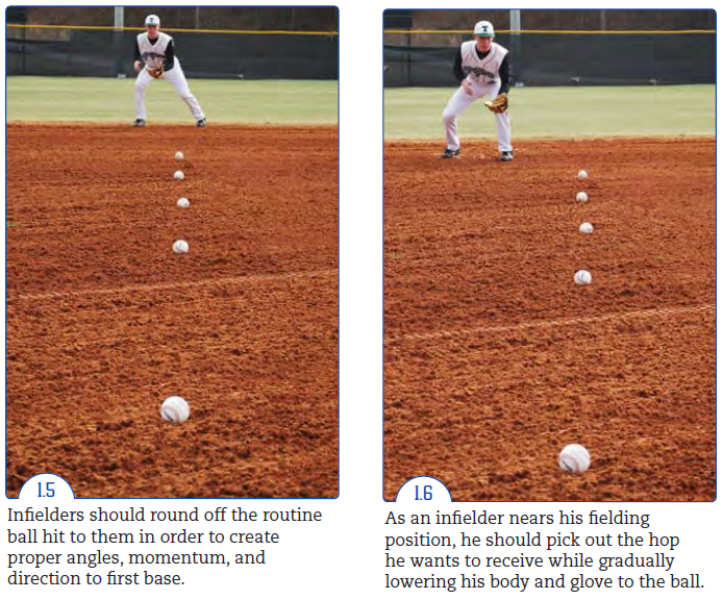 The player’s last two steps into his fielding position are right and then left (Figure 1.7). When an infielder fails to cut down his distance to a routine ground ball, he may be forced to rush his throws to first base. When an infielder chooses the incorrect hop to play, he may be forced to catch the dreaded “in between hop.” This is when the bounce of the ball is in between the fielder’s desired short hop or long hop. Regularly attempting to catch the in between hop will cause a fielder to be inconsistent and make unnecessary errors. When the ball is hit very hard at the fielder, to his left, or to his backhand side, there is no need for him to round off. The player’s only concern should be getting into a good fielding position to stay in front of the ball and field it cleanly. Because of the speed of the ball, the player will have the time to create the momentum needed to throw to first base. Moving off to the side of the ball allows a player to more accurately judge the speed of the ball and helps him choose the hop he wants to field. Middle infielders tend to round off routine ground balls more often than corner infielders because they are positioned further from home plate and have more time to implement desired footwork. Whenever possible, good fielder move their glove to a point lower than the ball to be ready to field it. It’s easier and faster to adjust the glove upwards to a ball rather than trying to lower the glove to field a ball that did not bounce as high as the player expected. The harder the ball is hit, the quicker the fielder must get his body on centre to the ball or he will not be in a good position to correctly field it. 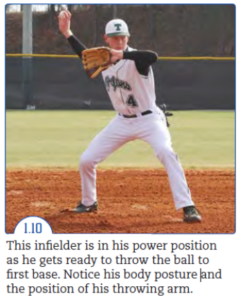 In order to field a ground ball cleanly, a player should be able to consistently get his body into a good fielding position just before the ball is grabbed. Legs should be spread wider than his shoulders. Weight should be on the balls of his feet. Feet should be slightly staggered with his left foot slightly in front of the right. Rear end is low to the ground. Glove is in front of his body at the top of the imaginary triangle created by the top of both feet and his glove. Fingertips are pointing down and lower than the ball. Glove is positioned just left of the centreline of his body and kept open to receive the baseball. Throwing hand should be above or to the side of the glove. Eyes are on the ball. Narrow feet (legs close together) will cause a player to stand too straight or tall when fielding the ball. The position puts the glove under the body and creates a blind spot for the fielder. This also creates an undesirable situation in which the fielder feet and glove are “boxed in” (between his knees) while moving into a position to throw. The causes the player to waste time taking extra steps to release the ball. The fielder should not create unnecessary movement with his glove while approaching the ground ball. This includes turning the glove side to side, presenting the back of the glove to the ball, flipping the glove, or raising the glove up and to the side of the body and then bringing it back down to a fielding position. All of these actions increase margin for error, thus decreasing consistency. If the fielder wears his glove so tightly on his hand that it causes the leather to rest against the skin of his palm, it will create “hard hands,” and the ball will tend to rebound out of the glove if it is not secured cleanly on the catch. To reduce this effect, the player should wear his glove semi-loose on his hand, with his wrist relaxed. The fielder should square his body to the ball and home plate when creating a fielding triangle. In the event the ball takes a bad hop, the player’s body will be in the correct position to knock the ball down to the ground right in front of him. He can then quickly retrieve the ball with his throwing hand and still have a chance to successfully complete the play. An advanced infielder often uses his glove to deflect the ball into his throwing hand without closing the leather to secure the catch. This action increase the speed of the transition and allows the player to make his throw to the intended target in the shorted possible time. 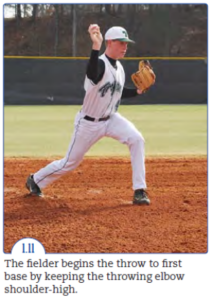 Teach players how to efficiently link energy from their fielding position to their power (throwing) position to maintain momentum towards the throwing target. Once the ball is fielded, a player should quickly take it out of his glove while simultaneously moving his feet to turn his body perpendicular to his target. There are two primary ways a fielder can go from a fielding position to a throwing position. If the ground ball was hit firmly, and the hitter does not possess great speed, the fielder can quickly cross his right foot in front of his left foot. This exaggerated movement creates more momentum towards his target, and provides a little extra time for a good transition of the ball to the throwing hand. The second method is to replace the feet or “click the heels.” Here the fielder tries to be more efficient with his feet by simply bringing his right foot to his left foot while the left foot moves in line with the target. This method is typically used the most by advanced players. Regardless of which footwork a fielder uses, he must stay low and move through the ball. This will allow him to use power in his legs to take stress off his arm and continue momentum in the direction of his throw (Figure 1.9). It is recommended that right-handed don’t step with their right foot behind their left foot while transitioning into a power position. This action incorrectly redirects the player’s momentum by moving it away from the intended target. When there is adequate time, fielders should instinctively adjust the ball in their throwing hand to create a four-seam grip. This will help the ball fly straight to the target, improving accuracy. 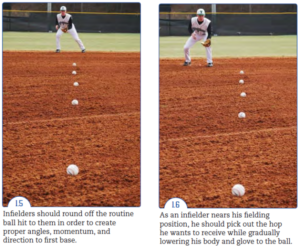 Fielders must learn to make a quick and consistent transition of the ball from the glove to the throwing hand so they will not be forced to take unnecessary steps towards the target before throwing the ball. That wastes time and gives the batter a better chance of beating the play. To save wear and tear on their arm, most advanced infielders choose not to throw the ball with maximum effort to first base on routine plays. However, if the play is difficult or the fielder drops or bobbles the ball during his transition, he may have to throw with more velocity to ensure he gets the batter out at first base. When taking ground balls in practice but not making throws to bases, all infielders should complete the fielding phases through their power position. This creates correct muscle memory that will improve a player’s chances of executing good footwork and a clean transition in the game when it counts. On the contrary, simply fielding ground balls and immediately turning to throw the ball to a coach or into a pail does not create game-speed footwork. It is acceptable after fielding a sharply hit ground ball for the player to take an additional shuffle before releasing the ball to first base. This allows the fielder extra time to ensure an accurate transition of the ball from the glove to the throwing hand, establish a four-seam grip, and get his body in a good position to make the throw. Accelerate the baseball from behind his body to a point in front of the body where it is released towards the target. 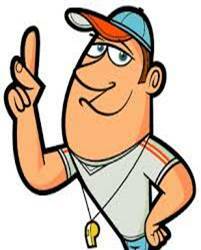 Two primary throwing fingers (pointer and middle) should stay on top and behind the ball. Throwing elbow should remain shoulder-high through release. As the player’s momentum continues forward through the throw, the glove-arm elbow and the throwing-arm elbow move closer together. This action reduces the player’s chance of working across the body, which would result in an inconsistent release point. The bottom half of the fielder’s body simultaneously adds energy into the throw by driving off the ground with the back leg and accelerating the hips into rotation. When releasing the ball, the fielder should extend his throwing arm towards the target and snap his wrist, which creates backwards rotation. A fluid arm action and release of the ball, will add distance and accuracy to his throw. Once the player releases the ball towards the target, he should complete the throw by allowing his arm to decelerate naturally and finish just outside his stride-foot hip. The back foot will simultaneously release off the ground and continue to move towards first base. Players should not stop moving after they throw. This destroys the fluid nature of the play and puts more stress on the arm. In addition, it will reduce the carry of the ball towards the target. A fielder should image that he is in a narrow hallway going to first base. His goal is to avoid banging any of his body parts into the walls as he throws the ball and maintains his momentum to first base. This will improve throwing accuracy.